I remember looking at the weather briefly in Salcombe, and what I saw for this week didn’t look promising. I, as I tend to do since I live in Scotland, thought it might change anyway since I am so close to the sea, and ignored it. The other thing that has started with my arrival in France is the that I no longer have the internet available, and I switched off my roaming data deliberately. McDonalds fills that gap nicely with free Wifi, France is not as advanced as the UK where free Wifi is now offered in virtually any public place of shop. So, the first time I looked at the weather again was in the wee hotel I stayed in on Tuesday night, and what I saw there justified the expense of a night in a hotel, as just as I arrived there it started to rain, heavily. Not that it hadn’t rained the Monday and Tuesday, it actually had, and much more than I had expected. However, the worst seemed to be over by Wednesday afternoon, and I chose to ignore that Nantes had 16mm forecasted for that night, which even for someone from Scotland is a hell of a lot of rain. Add to that the 100km/h gusts that I briefly spotted in the TV weather forecast and you have the perfect recipe for disaster. What I didn’t know back then all of this together was enough for an orange weather warning, perfect conditions for camping indeed. After a good night’s sleep I enthusiastically left the ferry, hungry to cycle in my first foreign country after Britain. Much of the route there was planned, and also involved seeing people I knew well, and that made the initial start very easy. Even for an experienced traveller like me the prospect of being away for a year is one I tended to ignore easily, and once on the road it hit me like a hammer. I travelled for about 2 months on the bike in New Zealand, although most of the time with others, not just on my own. I was also now in a country where I knew that English wouldn’t get me anywhere, especially in rural regions. So taken that into account the real round the world trip started here in France. To my advantage Brittany Ferries had kindly put me up in a cabin, and at least I didn’t start wet from the night before, as I had been soaked to the skin on the way to Plymouth, a sign of things to come? Unfortunately yes. And in retrospective the rain I had leaving the UK was mild. 6am on Wednesday morning, a moment that will stick in my mind for a long time. I felt utterly lost, I had nowhere warm and dry to go to, and the water made its way into the tent slowly but surely. I was a bit cautious when I got my tent, 2000mm for the flysheet didn’t seem exactly a lot, on the other hand I didn’t plan to camp in the height of the monsoon in Asia, and neither on the West Coast of New Zealand, both known for their massive amounts of liquid pouring down. When I pitched under a tree the place was soaked already from the torrential showers during the day, one of them had hit me in the afternoon and send little floods down the street. I just made it under the shelter of the tree, but that didn’t work, so I patiently stood there and waiting for the rain to clear, getting wetter and wetter. All of this was absolutely nothing compared to what came down since midnight, and I was getting increasingly worried about myself. I saved my down sleeping bag by stuffing it into it’s bag before is could get any wetter, by now the water had already run under my mattress. Too much I thought, time to limit the damage and pack up. Was I prepared for that much rain? Clearly not, a four season tent would have been the only option for such amounts, but I opted for a much lighter tent instead. I also don’t think that Nordisk is to blame for anything here, my pitching wasn’t the greatest and I should have been more careful knowing that conditions could become very unpleasant. I also wanted to stay inside, but the accommodation choices here in France are nowhere near as obvious than they are in Scotland. I cycled past a place that looked like a hostel but it was too early in the day to stop, even though the wind at that stage made for unpleasant cycling, with the odd bit of a tree fall on the streets from the storm. There was more rain to come, but fortunately there was a dry spell in the afternoon when I was able to dry the tent while enjoying my McDonalds coffee, and it was a great decision to do that, as a flat tyre forced me stop that night and stay at a camp ground. I hope it was a one off, but the women on the reception took my misfortune as the perfect opportunity for ripping me off. “17.33 please, and we don’t take cards”, she said in French. I showed her all my cash, which unfortunately only amounted to 15.30. She took that and I pitched my tent. In that moment I checked my phone and saw the reply from my Warmshowers host I contacted, and was gutted. I knew there was more rain to come, and hadn’t also made it to Royan to take the ferry the next day south, and now I was here on a campsite that frankly tried to make a buck out of my misfortune. Oh, there was Wifi. Well, not for me, as when I went back to reception to ask for the code I was told it’s another £1.50, and I was clearly out of cash. The next morning I checked the board, and I had clearly overpaid. When I asked in reception there wasn’t even a record of me staying, but I finally got my cash back. “Nobody on the road, nobody on the beach. I feel it in the air, the summer is out of reach. Empty place, empty streets, the sun goes down alone.” What I found in Soulac sur Mer reminded me of the Don Henley classic, and depressed me at the same time. With every meter I pedalled on a perfectly straight cycle track down the coast I felt the urge to leave. I had been looking forward to this stretch all the way down the Atlantic Coast to Spain for such a long time, and now I just wanted to escape. The pine tress, straight cycle lanes, boarded up second homes. The ugly reality when the beach crowds leave for the season. I didn’t intend to go to Bordeaux, but I needed to get out of here soon, and suddenly was on my way. Sophie kindly booked a room in a simple hotel for me, and when I cycled through the city, full of life, I knew i did exactly the right thing. After Bordeaux the landscape quickly become very monotonous and very artificial. I was back on the long straight roads again. After about 90k I stopped at a field with pigs, and albeit the smell they were the most entertaining animals so far. First scared by my presence on the fence with my camera they quickly started to play, throwing themselves in the mud, fighting with each other about food, it was a hilarious show. Just as I was about to cycle the next straight I bumped into another German cycle tourist, Eberhard, who was on his way North. I told him I was aiming for Tarnos that night, which he thought will be impossible, but as I like a good challenge and had a Warmshowers host waiting for me, I kept ploughing on. The scenery changed from endless corn fields into massive pine forests again, much like the area on the coast before I came to Bordeaux. Napoleon had cultivated this area, beforehand it used to be a massive wetland, inhabitable with loads of mosquitos. It felt though as many of the stayed, as I got eaten alive by them. At 10 I finally arrived at Tarnos, where Bruno and Letizia welcomed me warmly with food and red wine. I hadn’t used Warmshowers before, a website where people offer a place to stay in their homes for touring cyclists, and I was amazed when I found out about it. Being out for a year means being on a budget, but I also wanted to have an opportunity to stay with local people and get to know the countries better, hotels an hostels are roughly the same wherever you travel. Bruno and Letizia and their two kids were amazing hosts, but also helped me planning the next few days ahead. Ever since I left for France I knew that getting to Lisbon will be a tough ask. I had calculated that I would need to average about 130km a day, but that was based on Google’s shortest route, and from what I had experienced so far I was never able to match the shortest distance. Cycling through the plains before the Pyrenees had also made me think about what a good day on the bike looks like, and I wanted to have as many of those days as possible in the next year. Staying with Bruno and Letizia, both sharing their passion for the Pyrenees with me, made me change my mind. 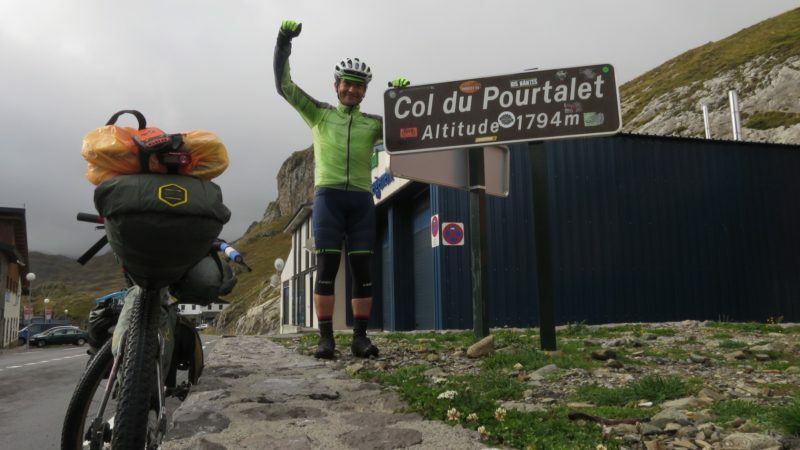 Since Bordeaux I had thought about ending the European leg in Barcelona instead, which would give me the opportunity to cross the mountains and end the first bit of the trip in good time to pack the bike and don’t rush things. Those who know me well know that changing the plan wasn’t an easy thing to do, but in hindsight I did exactly the right thing. Standing on the Col du Pourtalet a few days later at an altitude at 1794m was the highlight so far. This was by far the highest I had ever been on a bike, as Scotland’s mountains don’t get anywhere near their Pyrenees counterparts, and most of the mountain passes I had cycled in New Zealand also never reached the 1000m mark even. I could smell the excitement of the Tour that passes trough those mountains each year. To my advantage the markers at each kilometre make climbing 28km straight much easier. And just as I arrived on the top the clouds broke, I had tackled the climb in rain so far, which made it even more exciting. This was the riding I had dreamt of, and the Pyrenees were a stunning backdrop for days. Lush green valleys, first dominated by Basque houses and valleys with rich vegetation, finally gave way to some harsh and very steep mountains. What was fascinating was that I didn’t feel like climbing an alpine pass, as the tree line was much higher up than what I am used to from Scotland. Talking about Scotland, so far I had this idea that Scottish roads and climbs are tough. While the Pourtalet is possibly on the easier side of passes, it’s sheer length of 28k make your legs cringe. Given you only have one gear it’s pretty unforgiving. The good news is that I haven’t used a single pain killer so far, as body and mind are in excellent shape, and making it over here in good time was a proof for that. On the top of the Col du Iraty I had a real sense of achievement two days ago, and celebrating crossing the border to Spain with a Cafe con Leche. was a nice way to end my adventure in France. What had started as a wet ride, turned into a bit of a challenging ride in the middle, testing my mental abilities. Standing on top of that mountain pass marked a crucial turn though. I was missing the challenge of the mountains, the ever-changing riding, up and down. Never knowing what’s behind the next corner, that’s what riding in the mountains is abut, and what makes it so exciting. I just don’t get that feeling of excitement on dead flat roads, in so far changing the the route was the right thing to do. I wasn’t out for a record. I was put for great adventure, which has just begun. And the last days had proven that I did the right thing. While sipping the cafe I could see the clouds breaking even more on the Spanish side, and soon I was off on a long descent into a hot Spain, more on that soon!